Protests have erupted in Harare, Zimbabwe over alleged fraud in the country's election. Armed troops have since been deployed to try and disperse hundreds of opposition angry demonstrators. Zimbabwean authorities say the military will remain in the capital until "this situation is over", a reference to opposition protests over alleged manipulation of Monday's election results. Home Affairs Minister Obert Mpofu accuses the opposition of using the presence of international election observers to "grandstand" and cause "anarchy". The officials offered no new information on the three people killed after the military swept into Harare earlier on Wednesday and started shooting to disperse opposition protesters. Police have said they requested the military's help because they were "unable to cope". Zimbabwe's president is urging political leaders to advocate for peace "as this day that ended in tragedy comes to a close". President Emmerson Mnangagwa in a statement carried by state media says the opposition under Nelson Chamisa is responsible for the chaos "meant to disrupt the electoral process". European Union and US election observers are warning about the delay in announcing the presidential results and urge their release as soon as possible. 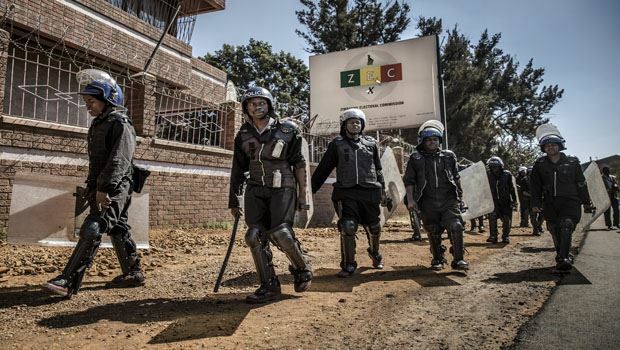 The US observer mission to Zimbabwe's elections says delays in releasing the result of the presidential vote are causing "suspicions, tensions and volatility." The announcement is expected at 12:30 p.m. local time (10:30 GMT). ZanuU-PF has now won 109 seats versus the main opposition MDC party which has taken 41 seats in the country's House of Assembly which has 210 seats.